Here at Faceworks we use Dermaceutic Facial Peels to enhance your skin's appearance and rejuvenate the skin. They range from mild peels to refresh the skin tone and texture, to medium peels which are stronger, with the ability to reduce fine lines & correct uneven skin pigmentation. Peels can also be used treat acne and soften the appearance of scars caused by acne. They can reduce the appearance of wrinkles caused by sun damage as well as skin blemishes common with age. They work very well, are very safe and well tolerated. We do not use deep phenol peels at Faceworks as they have significant down-time, can be very harsh & cause very marked peeling and face swelling- as you may have seen on extreme make-over programmes. With all our Dermaceutic Facial Peel Treatments you will need to come in for a Skin Analysis with our Aesthetician using our Advanced Skin Analysis Machine at least 10 days prior to your first treatment. Along with being given your skin analysis results, a personalised course of Skin Peels/Facial Treatments & Home Skincare Products will be recommended, to give the best results suitable to your skins needs. At this stage should you decide to go ahead with a course of Peels you will be given your Pre-Peel Preparation Products consisting of Foamer 5 or Foamer 15: both are glycolic facial washes, and a Dermaceutic SPF or nightcream(products will vary depending on client). These both need to be used by you at home for minimum of 10 days in advance of your first treatment. This ensures an even base for application of the peels, allowing optimum results and also ensuring that your skin will tolerate the peel products.We also recommend that you use specific Dermaceutic Aftercare Products to help upkeep the results of your peel at home. Our Glycolic, Mela and TCA Treatment Peels take approximately 30 minutes. These do not include a facial/massage treatment as this is not suitable for combination with aPeel. Light or superficial Glycolic Acid Peels do not result in visible skin peeling or shedding, and have no down time. You can however expect to be a little pink after treatment, so it is recommended to have your treatment on a day that you haven’t much on, as for optimum results use of make-up would not be recommended for the rest of the day. Medium strength TCA Peels or Mela Peels however do cause skin redness and tightness that lasts for a few days, this then leads on to mild skin flaking and light peeling. Although you will feel perfectly well, most people take a few days off work while this happens to avoid having to explain the skin flaking/shedding. This is explained in more detail later in this article. We recommend a course of 4 treatments, every 2 weeks. A deeply cleansing clay-based professional peel treatment which is very effective in helping to reduce visible pores and excess sebum. It purifies the epidermis (top layer of skin) & tightens pores whilst removing dead skin cells and deeply cleansing the skin. Recommended for acne prone & oily skin types. A milky textured professional peel given its names from its lactic acid content. It is used for fine line reduction, skin lightening, sebum (oil) regulation and as a spot treatment. Our milk peel facial treatment restores skin radiance and stimulates the epidermis, improving loss of skin tone whilst having a smoothing softening effect on the skin. It is also excellent for boosting the actions of your daily cosmetics. Recommended for skin with fine lines & wrinkles and dull/tired complexions. • No numbing creams are required for TCA peels. • A course of 2 treatments a month apart is recommended. There is some down time, which consists of redness and skin tightness for one to two days after the TCA peel, then 3-4 days of peeling and flaking. You will feel well, but may want to take a few days off while the peeling occurs. TCA Peel patients are advised to avoid strong sun exposure and to use a sun protection cream (minimum SPF 30) for several weeks following treatment. Failure to comply with this recommendation may produce some unintended colour changes in the skin. Skin Preparation may be required on those with darker skin and hyper-pigmented areas. This involves using a lightening and smoothing cream two weeks prior to TCA Peels. People with active acne also require skin preparation with the purifying cream two weeks prior to TCA Peels. At Faceworks our TCA Peels (Cosmo Peel) are administered by our Medical Doctor.The procedure involves applying a solution to the skin. The solution does sting, but we use a fan to coll the face. There is some initial whiteness (frosting) of the skin for about 30 minutes. The peel causes the outer layers of skin to flake and peel off over the following days. The new regenerated skin underneath is usually smoother, less wrinkled and more even in both tone and colour than the old skin. Typically the skin is first thoroughly cleansed. Our medical doctor will carefully apply the TCA solution. You will feel a stinging sensation as the peel solution is applied, but the feeling will quickly pass once the practitioner applies the fan and the post-peel cream, which you leave on until the next morning. 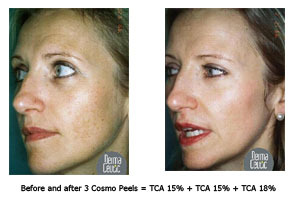 A full face TCA peel usually takes no more than 15 - 30 minutes. Initial whiteness of the skin (frosting). This clears within 30 minutes. Increased feeling of heat in the skin being treated. Occasionally you may experience an itchy feeling in the skin being treated. A medium strength profession peel product used for rejuvenation of sun damaged skin and reducing wrinkles & texture irregularities. It reduces the signs skin ageing, improving elasticity whist helping with dark spots & pigment disorders and helps regenerate smoker’s complexions. Cosmo peel is recommend for ageing skins, smoker's skin & sun damaged skins. • Day 1: Immediately post peel you leave the clinic with the post peel cream applied. This is translucent and non-oily. The skin will look slightly red for a couple of hours and will generally feel comfortable. You should not touch the skin, and do not apply any creams or use water on the face until next morning. Avoid extremes of heat exposure and sun exposure. • Day 2: The skin will begin to feel tight. Wash the face with the cleansing foam, and the treatment creams recommended should be applied morning and night. Sun protection of at least Factor 25 should be applied. • Day 3: Some pigmentation change or peel may be noticed at this stage as the skin begins to dry and will start to flake. The treatment creams recommended should be used at least twice daily. • Days 4-7: The peeling eases and the healing process takes place. You should continue with the recommended creams and sun protection. You should not attempt to peel or pick off the skin or use abrasives, scrub creams or products containing AHA’s or retinol. • Day 8: You return to the clinic for review, and to schedule follow-up treatments. 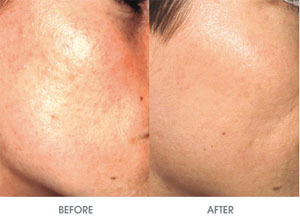 Our Mela Peel Treatment is extremely effective in reducing pigmentation as it works on all mechanisms of pigmentation. It has no down-time and minimal risks of side-effects. It is a medium strength professional peel with a highly concentrated formula and combination of active ingredients to ensure optimal results which are long lasting with on-going patient care. Mela peel promotes an even complexion, improving skin radiance and brightness, for this reason it is suitable for all skin and photo types but is recommended for skins with pigmentation disorders. 1)- Activa Peel - This pre-peel prepares and exfoliates the skin for the Mela Peel application and ensures fast penetration of all active ingredients. 2) - Mela Peel - Inhibits the production on melanin an exfoliates the skin to decrease the appearance of pigmentation. 3) - Mela Cream - This aftercare cream regulates pigment production in the long term and booststhe whole Mela Peel treatments depigmentation action. Pregnant or breastfeeding women should not have this treatment. If you have a history of cold sores, you should inform the Aesthetician on receiving your skin analysis prior to the procedure, as the Doctor may suggest a course of anti-viral tablets starting two days before the peel. This is to minimise any risk of the peel provoking cold sores. Your medical history will be reviewed with you during your initial consultation prior to administering any treatment. During your initial consultation it is important that you discuss your expectations with our Aesthetician. Don’t hesitate to ask any questions or express any concerns that you may have. You will be able to ask any treatment related questions and she will explain the planned procedure in detail, including the risks and benefits, the recovery period, and the costs. All products have a potential for allergic reactions. It is Important that you inform the practitioner of any allergies you may have. Transient reactions may include redness to the skin, itchiness, dryness and in some cases swelling. This will settle during the course of treatments and with use of the appropriate treatment creams and sun protection. Although very rare, there may be in some cases a risk of blistering.